There is a wealth of free food available in the wild, if only you know where to look. As the interest in nutritious, locally produced food gathers momentum, we are also seeing a renaissance in foraging with more and more people enjoying the hunt for nature’s wild edible bounty. In the past, foraging skills and knowledge were passed from generation to generation among country people, but for most of us today it’s a new and exciting skill to be learned. Douglas Deur’s Pacific Northwest Foraging is a field guide written to help foraging enthusiasts safely identify edible foods. Well illustrated with excellent full-color photographs of the plants (a great help for accurate identification), each listing includes the edible plant parts, a flavor description (the licorice fern “root can be used fresh or dried in teas, where it provides a licorice flavor.”), how to identify, where and when to gather, how to gather, how to eat, how to preserve, and future harvests (tips for sustainable foraging). Deur explains that while lamb’s quarters is a pesky weed to most of us, it is a valuable crop to Asians and Africans. He writes, “This lanky introduced weed . . . is among the tastiest invasive weeds one could ask for.” It is a nutritious green that can be used like spinach. Try substituting it in a spinach quiche. You’ll never know the difference. Readers will discover that cow parsnip (described by Deur as “Queen Anne’s lace on steroids”) is commonly called Indian parsley because it was an important component of the Native American diet. Although the plant’s leaves and outer stalks are pungent smelling, the inner stalk is mild, tasting like celery, and can be used as a celery substitute. The author cautions, however, that the plant juices can cause skin blistering. Handle with care. Another wild specimen whose seeds and greens have a celery flavor is biscuitroot. The plant roots range in appearance from radishes to carrots, tasting spicy when raw, sweet when cooked. 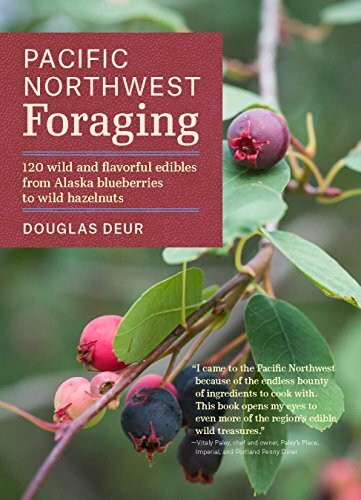 Pacific Northwest Foraging: 120 Wild and Flavorful Edibles from Alaska Blueberries to Wild Hazelnuts by Douglas Deur is an excellent reference for anyone with an interest in foraging. For those with no interest, it may spark an unrealized fascination. Sized to fit easily in a daypack (6.5” x 9”), this book is worth taking along on any hike—or even a walk through the neighborhood.